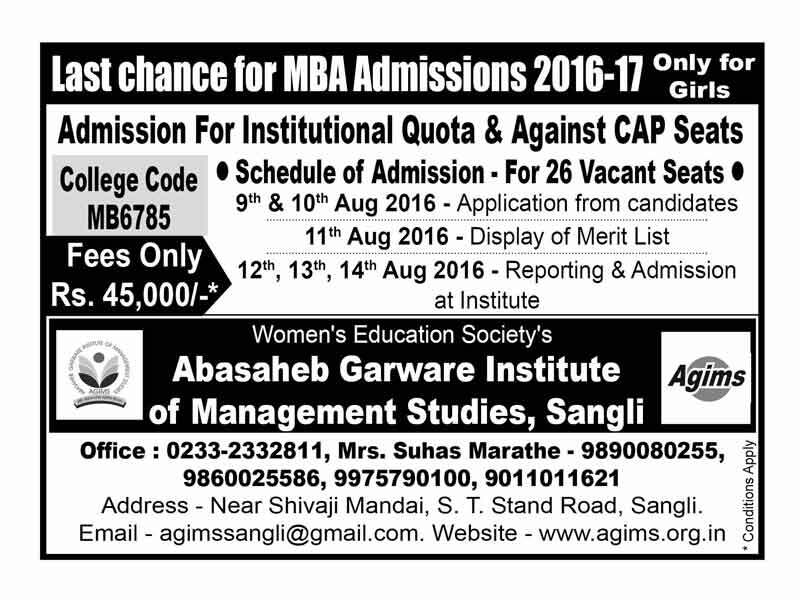 Let me first thank you for visiting the website of Abasaheb Garware Institute of Management Studies, Sangli (AGIMS). Welcome to our new and updated website, and do go through its various features. Our institute is established under the flagship of Women’s Education Society. Women’s Education society was established in 1933 for the education, welfare and upliftment of women. The institute is a women’s institute of management studies in the southernmost part of Western Maharashtra, and students from all communities and religious beliefs come together to learn and lead. The full time MBA course-work syllabus is taught by well qualified and experienced faculty. Also lectures of eminent personalities from diverse fields are arranged to give insights on various topics. Industrial visits, organizing and participating in intra-college competitions, and other varied activities makes for a dynamic learning process. I would like to extend an especially warm welcome to our alumni, who make us proud. Our institute will always strive to empower women thru excellent management education and fine values that will make them efficient managers and able citizens.